The controversial backstop will be on the agenda when Theresa May heads to Brussels after MPs backed an amendment to replace the plan with “alternative arrangements”. This would mean a reopening of the Withdrawal Agreement thrashed out between the UK and EU as the parties bid to find a way of avoiding a hard border in Ireland. However, European Council president Donald Tusk has said the agreement is not open for renegotiation. Put simply, it is an insurance policy to ensure border posts and checks on vehicles do not return to the border between Northern Ireland and the Republic of Ireland when Britain leaves the EU. What did the amendment call for? Drafted by Sir Graham Brady, the amendment called for “the Northern Ireland backstop to be replaced with alternative arrangements to avoid a hard border”. It passed by 317 votes to 301, a majority of 16. Has the phrase “alternative arrangements” been used before? Yes, in the 26-page political declaration which was published alongside the Withdrawal Agreement, both parties agreed to “replace the backstop solution on Northern Ireland by a subsequent agreement that establishes alternative arrangements for ensuring the absence of a hard border on the island of Ireland on a permanent footing”. 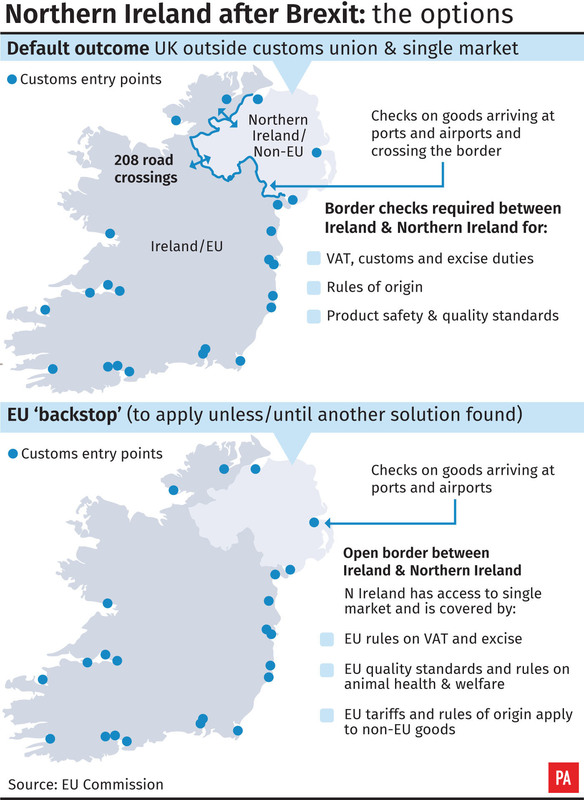 How do you solve a problem like the Irish backstop? The simplest, but probably most controversial, way of avoiding the issue of a backstop on the Irish border is a revocation of Article 50 and the UK remaining a member of the European Union. Although the shape of any “alternative arrangements” were not spelt out in the Commons – shadow Brexit secretary Sir Keir Starmer called them “unspecified” – a number of methods have previously been suggested. One is adding a “sunset clause” into the backstop which would add an expiry date to the provision, which could allay fears of Britain permanently being locked into the customs union. Another, which was mooted in November, was using technology to overcome the issue of the Irish border. The political declaration referred to the use of “facilitative arrangements and technologies… (being) considered in developing any alternative arrangements for ensuring the absence of a hard border”. This could see technology being used which would allow customs checks to take place away from the border – including potentially having declarations made online. In November 2017, the head of Swiss customs Dr Christian Bock spoke about their solution at the Northern Ireland Affairs Committee, and, when asked by Bob Stewart, said an “effective but non-invasive border for Northern Ireland was possible”. He said: “Yes, that is possible. What would you need to do? You need common patrols between the United Kingdom and the Republic of Ireland, staffed with the same people and with the common goal of finding irregularities. “Secondly, you need an intelligence strategy for what you are looking for.